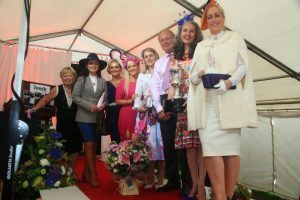 The ‘Most Appropriately Dressed Lady’ competition at the Iverk Show boasts some of the best prizes available during the day. The winner gets one night’s dinner, bed and breakfast at the luxurious five star Merrion Hotel in Dublin. The next day with a €400 voucher in her handbag can visit the flagship store of Irish Designer Louise Kennedy in Merrion Square. Whats more she will enjoy a glass of champagne and a personal shopping experience. Wow!!!! Mary McEvoy from ‘A Slice of Heaven’ provides second prize of €150. Third prize winner gets a meal for two at Anthony;s Inn in Piltown. Again we sincerely thank and appreciate the generous sponsorship. The title ‘Most Appropriately Dressed’ takes into account the weather conditions on the day. If is fine or if it is wet entrants must take this into their dress sense. Thankfully this year was again fine.